From the new Bangkok airport rail link, to subways and tuk tuks there are so many options for getting around Bangkok. 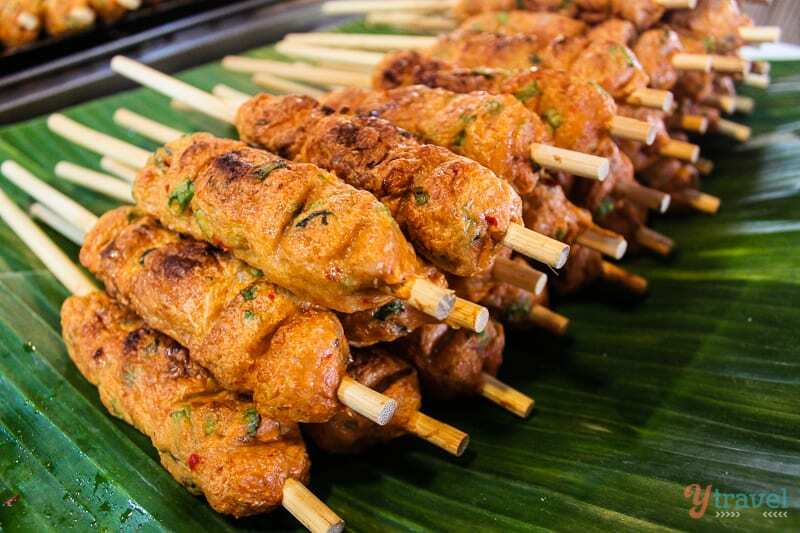 Here’s a short guide to help you find your way around Bangkok, Thailand. 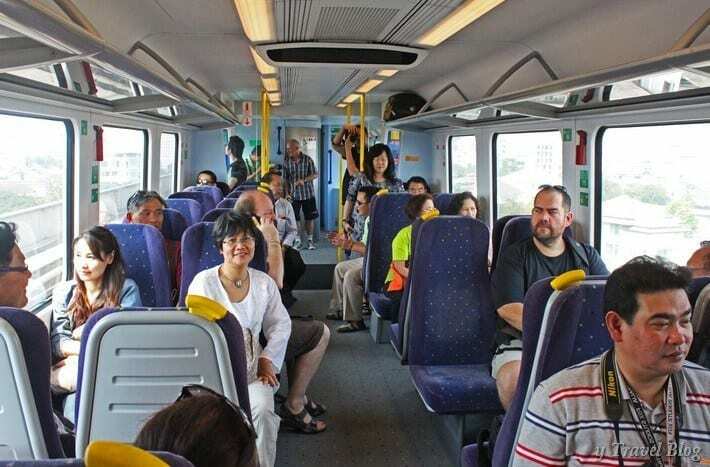 Have you taken the new Bangkok airport rail link? Do you have any getting around Bangkok tips? I don’t really get excited to travel on trains, but I was when I took the Bangkok airport rail link. Not because it was a train, but because it was exactly the solution I need when getting to and from airports. I loved not having to worry about expensive airport parking, or train fares (the Sydney airport link is extortion), slow buses, expensive cabs or dirty public transport. The Bangkok airport rail link is cheap, clean, efficient and gives you the chance to watch greater Bangkok pass by your window. The airport link is only new; opening in 2010 I wish it was around when we were living in and getting around Bangkok. I wouldn’t even consider any other way now of travelling to Bangkok airport. Tickets are 90 baht one way and 150 Baht return. Your return ticket has a two-week validity. Express tickets can only be bought from the booth and run every 30 minutes. At Makassan station you can check in for your Thai Airways flight. If you have an evening flight, check your luggage in and then go hang out in the city until you need to go to the airport. Cool idea! If you want to save a little more money and you have a bit more time then take the City Line to Bangkok airport. Trains run every 15 minutes, there are six stops and it takes 35 minutes to get to the airport. Tickets for this train are 45Baht. 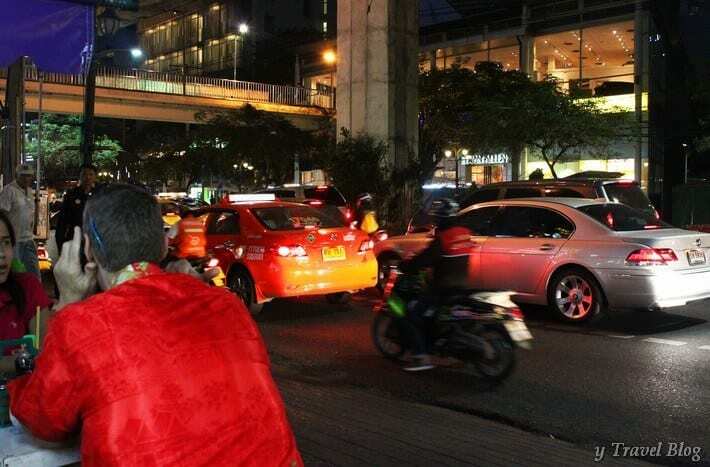 Unless it is very early in the morning or late at night, I wouldn’t even consider getting a taxi to the airport in Bangkok. A metered taxi to the airport will cost from 200- 400 Baht depending on traffic. If you take the toll way (which in Bangkok traffic you should) then you will pay an extra 70B. Always insist that the meter is turned on when you enter a Bangkok taxi. 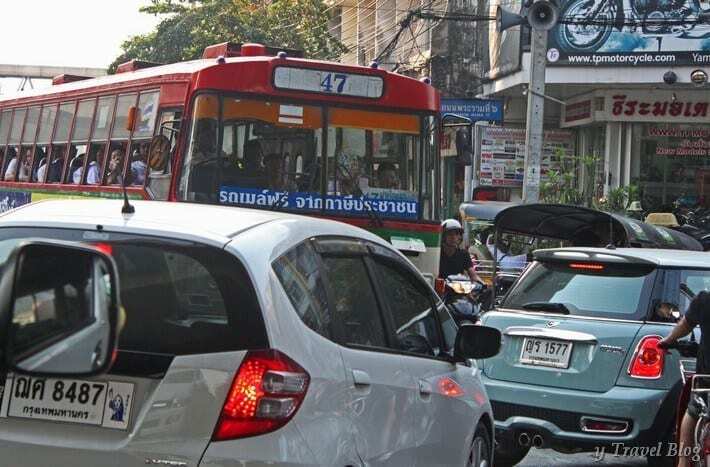 Be aware that if you take one within Bangkok you will have to deal with added costs due to traffic delays. There is one line serving 18 stations in Bangkok, going from Hua Lamphong in the South (near Chinatown) to Bang Sue in the north. Bangkok MRT subway trains run every 5-7 minutes and connect to BTS at Sukhumvit and Silom stations. Commuters can buy single trip tokens (15 to 40 baht) or one-day passes for unlimited trips for the day at 120 baht and three-day passes at 300 baht. The BTS Sky Train is an excellent way of getting around Bangkok. You will really appreciate it on a stinking hot day as the AC is freezing. The sky train can get you around Bangkok quite quickly. The BTS Sky Train covers most of downtown Bangkok. Fares range from 15 to 40 baht depending upon how many zones you are travelling. Consider a rechargeable stored-value card (from 100 baht), a “ride all you like” tourist pass (from 120 baht per day) or a multiple ride pass of 20 trips or more to any zone (15 trips cost 345 baht, 25 trips cost 550 baht; plus a 30 baht refundable deposit for a rechargeable card that is valid for 5 years). Tuk tuks are one of my favourite ways of getting around Bangkok, despite the ride being on the edge of your seat and full of pollution. There are many places the Bangkok rail network will not reach. In that case you have to take a bus, walk or a tuk tuk. Even though tuk tuks are more expensive I would often opt for them just for the thrill of it. Riding a tuk tuk will involve bartering and before you start your journey. Tuk Tuk drivers will always try to overcharge the tourists. Offer the price you are willing to pay and see what they say. If they say no, walk way. If they follow you, you know that your price was reasonable, barter a little more to meet in the middle. I was fortunate enough to be an English teacher and know a little Thai, so before I would start the negotiation I would mention this and would get a much more favourable price. We loved getting around Bangkok in a bus. The constant clacking of the conductor’s change tin as he tried to wriggle his way through the sweaty armpits of all of Bangkok squashed into the bus is a memory that will last forever. Hold your nose, hold on tight to the overhead hand ropes or the person next to you and enjoy the cultural experience. They are a very cheap way of getting around Bangkok. Craig caught Bus 47 every day to work for only 7 baht. The off-peak drive would take him 15 minutes, but during those heavy periods it was an hour to an hour and a half. The price of buses depends on their colour and they range from 6 – 20 baht. 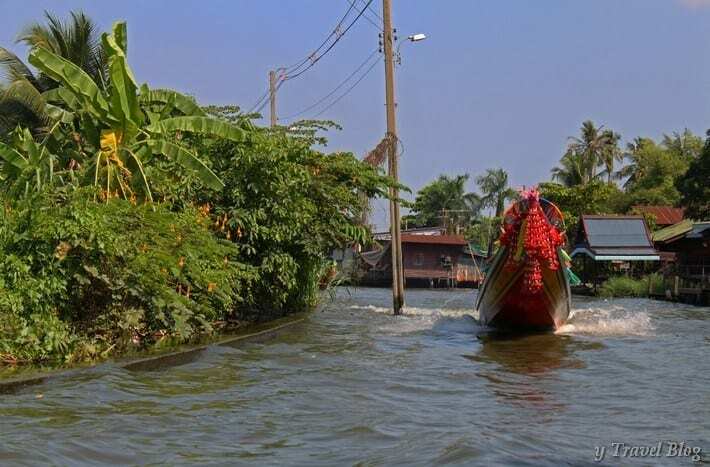 A cheap and unique way to get around Bangkok and see the backside of it is by river boat. The Saen Saep express boat is mostly used by commuters and goes down one of the few remaining klongs (canals). 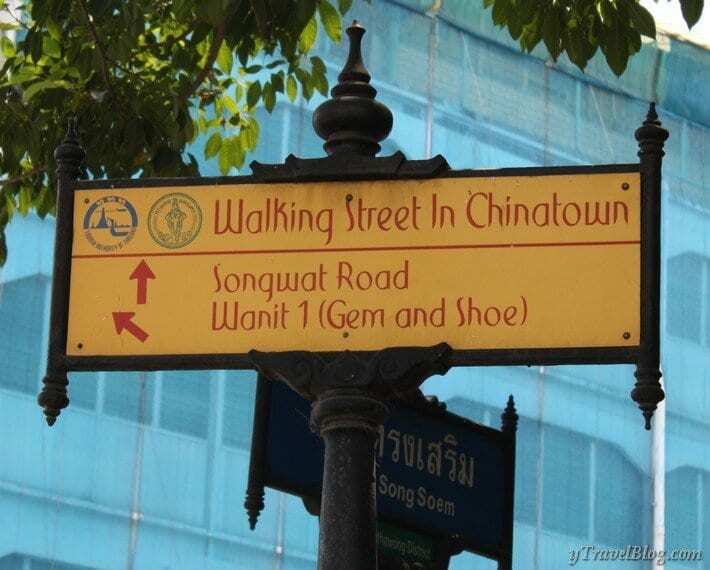 It provides easy access from the Golden Mount (our old home and close to Khao San Road) to Siam Square. The fare is 14-22 baht. Watch you step getting on and off. There are also slightly more comfortable tourist boats that cost 30 baht. There is so much to discover and explore in Bangkok. Walking is the best way of experiencing the city and its people. It won’t cost you anything and has less impact on the smog that shrouds the city every day. Most of the time walking is quicker and more peaceful than dealing with the horrors of Bangkok traffic. Great tips guys! A must read for anyone going there for the first time! Thanks for the Bangkok tips, I’ve been there several times, but I never used anything but taxis. I knew there were other options, but was to lazy to figure them out. The traffic is horrendous. Never take one wrong turn as it will add an extra hour on your journey trying to get back on track! Go the rail networks so much better. wow! Such a amazing post. I get some of the great traveling tips. I never ever thought that traveling in trains and bus are such an exciting experience. hi Caz, great post for a first time traveller to Bangkok. I too think its more easier on the nerves to take the Airport express to Phaya thai and then switch to the BTS from Phaya Thai to Asok where my Hotel is situated (Sukhumvit soi 18) . However im just a wee bit concered about the crowds on the BTS From Phaya Thai to ASOK on a sunday noon time arrival. all the more since the three of us will have luggage. You should be okay with a Sunday arrival time. It will be crowded but not as much as weekday. We did it with the two kids and managed. You’ll be fine. The locals are lovely and will help you. Thank You for your detailed blog. We are so excited to tour around Bangkok and will surely take note of your tips. thanks for the advice and the info. I would like to know if it is safe to catch a train at night from the airport going to Hua Lamphoong train station as our hotel is 200 meters away? My concern is we are arriving 8PM but likely out of the airport by 9pm, after the customs check. Every thing I have indicates that taking train is quicker and much cheaper, but is it safe at night time though? Going to Bangkok again for the first time in 6 years so excited to try the new airport link 🙂 Thanks for the tip!